FILE - Hafiz Muhammad Saeed, leader of the Jamaat-ud-Dawa group, or JUD, addresses his supporters in Lahore, Pakistan, Jan. 30, 2017. A militant group leader in Pakistan is suing the country’s foreign minister for his remarks at an Asia Society event last week in New York. A lawyer representing Hafiz Mohammad Saeed sent a $950,000 (100 million Pakistani Rupee) notice to Pakistan Foreign Minister Khawaja Asif on Friday. “An absolute lie and falsehood that Hafiz Muhammad Saeed is one of those persons who had been the darlings of Americans and had been dining and wining in the White House,” Saeed’s lawyer, A.K. Dogar alleged, according to media reports. The lawsuit calls on Asif to offer an apology within two weeks or face punishment. Defamatory statements are punishable under the Pakistan Penal Code with up to five years imprisonment and a fine, according to Dogar. Refuting recent allegations by the United States and BRICS, an economic bloc composed of Brazil, Russia, India, China and South Africa, that Pakistan harbors violent extremist groups that pose a threat to regional security, Asif denied that his country supports such groups. "Don't blame us for the Haqqanis [the Haqqani Network] and don't blame us for the Hafiz Saeeds. These people were your darlings just only 20 to 30 years back. They were being dined and wined in the White House and now you say 'go to hell Pakistanis because you are nurturing these people'," Asif said, referring to the U.S. support to Afghan resistance movement during the Soviet invasion of Afghanistan in the 1980s. Saeed’s lawyer alleged that his client is a “patriotic Islam-loving Muslim” who refrains from consuming intoxicants, which are forbidden in Islam. "I have been advised by Hafiz Muhammad Saeed to tell you that he has never been near the White House, not to speak of [being] wined and dined. It is shocking to know that the foreign minister of my country is accusing Hafiz Muhammad Saeed of taking wine,” Dogar said in the notice. 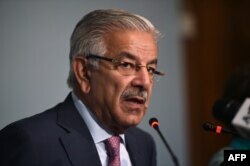 FILE - Pakistani Foreign Minister Khawaja Asif briefs the media in Islamabad, Pakistan, Sep. 7, 2017. Saeed is a U.S.-designated global terrorist. He has been accused of orchestrating militant attacks against Indian interests in the region, including the 2008 Mumbai attacks that killed 166 people, including six Americans. The U.S. government has offered a $10 million reward for information leading to his arrest. He is also on the U.N. blacklist. Saeed has been under house arrest in Pakistan for the past several months. Saeed leads the Jamaat-ud-Dawa group, or JUD, which has been listed as a sponsor of terrorism by the U.S. State Department for more than a decade. JUD contends it is a humanitarian organization without links to terrorists, but it is widely considered a "front group" for Lashkar-e-Taiba (LeT), which has been banned for terrorist activities since 2001. "Saeed, LeT, they are a liability, I accept it, but give us time to get rid of them," Asif said Tuesday in New York. The move by Saeed’ lawyer drew some reactions of surprise on social media. “There is irony, and then there is irony. Not sure I can recall any other case of a terrorist suing for defamation,” Michael Kugelman, a South Asia analyst at the Woodrow Wilson Center in Washington, tweeted. “Hilarious. Global terrorist Hafiz Saeed seeks damage to the tune of 100 million from Pak FM Khawaja Asif. Can Pakistan economy afford it?” Indian journalist, Aditya Raj Kaul, tweeted.